Monday, November 6, 2018, author Tim Applegate will be speak at our Monday morning workshop from 9AM-11AM at the Forest Grove Senior and Community Center in Forest Grove, Oregon. This is a free, regular workshop event and all are welcome to join us. Bring pen and paper and an open mind as usual. Tim Applegate will be speaking about publishing submission acceptance and rejections. He is the author of the novel Fever Tree and three books of poetry. A commercial contractor specializing in furniture and wood restoration for the hotel and cruise ship industry, he retired in 2015 to dedicate the next part of his life to writing full-time. He is the co-winner of the Tillie Olsen award for Creative Writing, and his work has been published in the Florida Review, The South Dakota Review, Lake Effect, The Briar Cliff Review, and others. He currently lives in the foothills of the Coast Range in Oregon. Writers in the Grove is a creative writing group, focused more on supporting each other’s writing passions through education and writing opportunities. Some of us are also published from time to time. While the group’s focus isn’t on how to get published, we do cover that topic occasionally. This article serves as a general tutorial and guide to help you get your work published for the first time, taking you step-by-step through the generic process of submitting your work in article, story, or poem formats, not novels and non-fiction books, though the process is similar. The process begins with craft, learning as much as you can about what you are writing and preparing to submit before you begin the process. Each writing genre has specific standards for writing format, form, and function, and it is part of the development of your craft to learn these. Understand, editors don’t want to reject anyone’s writing. Their job is to accept and reject those that don’t pass through their filters. Many editors are inundated with dozens if not hundreds of submissions weekly, sometimes daily, so they’ve learned to reject for simple grammar mistakes or be the rare ones to see past the poor language skills to find the gem of the story. Present your best work so you never give them an excuse to reject your work. Writers in the Grove offers a chance for you to bring your short story or poem to our group to read in the second half of our weekly workshops. This is a great opportunity for gentle feedback, but also practice your reading skills. We also produce two author reading events annual, Lend an Ear and Wintersong, a chance to submit and read a 4-minute piece before an audience of 50-100 people, again, another excellent opportunity to read publicly and get public exposure for your work. Learn How to Spell or Use Spell Check Wisely: Some editors are forgiving about the occasional spelling mistake, others are not. If you regularly misspell words, learn them or pay close attention to them when you use them. Learn Punctuation Rules: Learn how to use punctuation, and understand why you use commas, colons, semi-colons, hyphens, and quote marks, and how to constrain yourself from using exclamation points. Become a Grammar Guru: Learn sentence structure, prepositions, clauses, and how to use and not use them. Writing is a non-stop class in how to use the language. Learn to use it to craft the words into a symphony. Edit Brilliantly: Edit your work. Never submit a first draft. Craft your draft. Only submit your best work, so edit with a strong and graceful hand. Get Feedback: There are many groups dedicated to helping you publish, giving you the high-powered review and critique you may need to succeed in the marketplace. Writers in the Grove members will give you gentle feedback, designed to encourage rather than discourage, though we will give you a harder review if you ask, we are not publishing experts nor editors, just writers with experience. In addition to our group, look for groups focused on publishing in our area or online to improve your professional writing skills. Network and Build Relationships: Some writers rarely submit their work for publication. Editors invite them to submit because they have established a connection, a relationship, and reputation for quality work. Look for opportunities in your community to attend other writing groups, conference, and workshops to get to know others in the business. Travel to writing conferences, and find a way to connect with those who are buying your work. Take Classes, Read Articles, Study Books, Learn Writing: You are never too old or experienced to stop learning about your craft. Luckily, the Portland area is stuffed with exceptional colleges and educational facilities offering writing courses, workshops, and events. 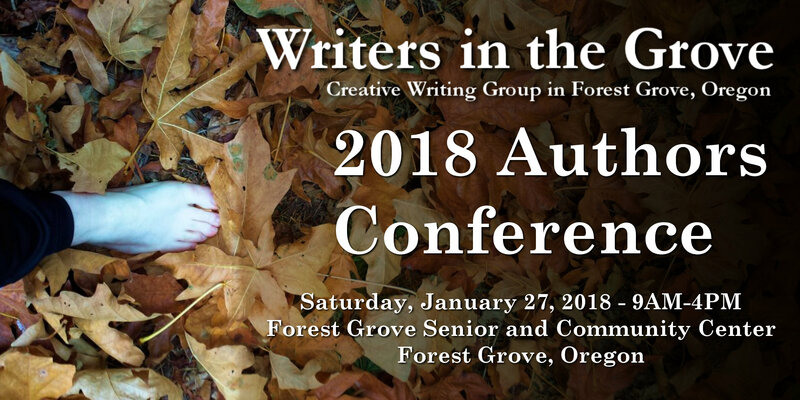 Don’t forget the Willamette Writers and their monthly activities and annual conference. Learn What Publishers Want and Need: As with everything, writing is part of the supply and demand economy. You have to give them what they want to buy. Carefully study their publication. Read through their guidelines for writing and submission as well as their want lists to give them just what they need. There are two videos by a bestselling journalist and author that take you on an in depth but easy-to-do bootcamp learning how Scrivener works. Along the way, he shows you some of his techniques, great ways of rethinking how you write as well as how you use Scrivener. Pause and rewind as you need and rewatch them again and again as you learn more about how Scrivener works. If you watch any videos on Scrivener, these should be the two you choose. They are each about 60-90 minutes long. Some of the members of Writers in the Grove recently purchased it based upon my advice, and they’ve asked me to present a workshop on Scrivener basics soon. In the meantime, to help people get started, this is an introductory series on how writers can, and should, use Scrivener. Scrivener is software for Windows and Mac. It is designed for professional writers to ease the process of researching and writing. It is used by professional (and not) writers, authors, script writers, poets, teachers, researchers, and anyone with a writing project. Microsoft Word or its equivalent is used by most people to “write.” It is a word processor. It processes words. You can style and format them, making them pretty, and even write great papers and novels, setting up table of contents, chapters, page numbering, and indexes. For a writer who writes many things, or is working on a book, working with a Word document is like writing on a never ending ribbon. Navigation is a nightmare. Finding things is horrid. It’s easy to get lost, repeat yourself, and just lose track of what you are doing. This roundup of writing tips comes from editors – specifically editors screaming to writers to LISTEN AND OBEY! Editors are the sheriff to our published words, the one who rounds up the misbegotten criminals and victims of our words. We owe it to them to listen to their great words of advice so we become better writers before we hand over our words to them. Ten useful writing tips from a frustrated editor – One Salty Blonde: This is not directly from an editor but from a writer with a fantastic editor who left notes on her book that not only made it better, but made her a better writer. 5. Avoid weak adjectives and most adverbs. They weaken writing. So instead of walked quickly, write dashed or bolted. Instead of tall man, write about him towering over something. 6. Do a search of “that” when you are done with a piece. Then take out the ones that are unnecessary. It will be lots of them. “He said that he didn’t do it.” Imagine you must pay $5 for every unneeded that. There are some bloggers who seem to have a natural gift when it comes to writing. Some bloggers seem to be naturally gifted writers. They manage to get their ideas across clearly and economically, which means that readers can easily follow what they write. Readers devour their clear, economical prose. Not only is there a lot of respect for what they have to say, but also the way that they say it. People respect what they say – and love how they say it. Some beautiful lessons on editing in that. Here are a few more good tips, advice, and instructions from editors to editors and to writers. Our writing tips posts usually feature a variety of articles from around the web offering great tips for writers, specifically those writing fiction and memoir. Today we’re going to do things a little differently because we’ve found a great resource stuffed with writing tips. Botham Writers offers “Writing Tips from the Masters,” a collection of writing tips and advice from top authors including Neil Gaiman, P.D. James, Jack Kerouac, Michael Moorcock, Elmore Leonard, Billy Wilder, Joyce Carol Oats, Henry Miller, Joss Wedon, Struck & White, and a wide variety of classic and modern writers. It covers all types of writing, from general writing and professional writing tips to writing scripts and published material. Get through all of these and you might find the secret sauce in good writing. Sell it with the first line. We were to sum up a piece of writing we’d like to submit for publishing in a single, powerful sentence.